Talk about your professional service. 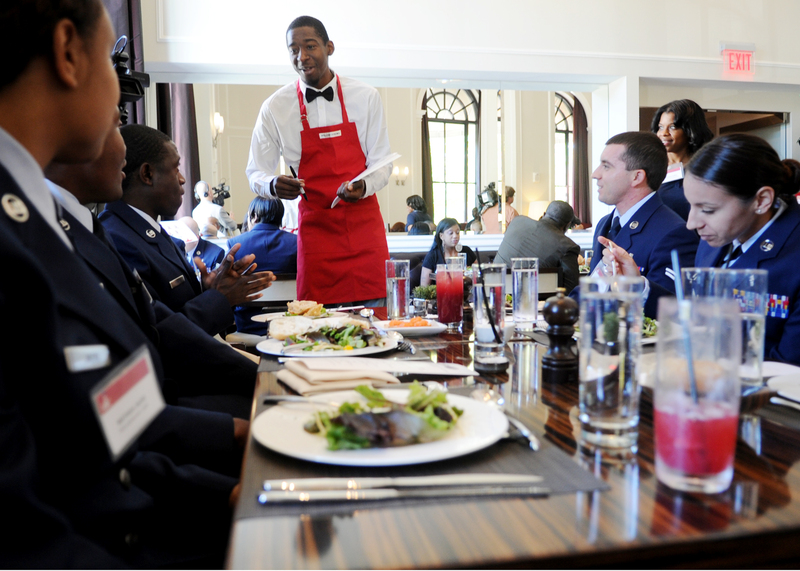 More than 20 airmen from Joint Base Andrews, Md., were served lunch by members of the NBA’s Washington Wizards at a downtown steakhouse in Washington on Oct. 22. The airmen were invited as a part of the Wizards’ 3rd Annual Salute to the Stars, according to an Air Force news release. Emeka Okafor, John Wall, Jordan Crawford, Shelvin Mack and rookie Bradley Beal, along with Wizards assistant coach Sam Cassell, a retired All-Star and owner of three championship rings, and Washington Bullets alum Phil Chenier served a three-course meal to those who serve as a token of appreciation for their service. The Wizard Girls were also on hand to show their spirit. The focus was to recognize service and family members who are caregivers for wounded warriors as part of the “NBA Cares Week.” Honorees from each branch of service were invited to dine and several wounded warriors were in attendance to show their appreciation as well. During the luncheon, the players took time to specially recognize family members who lost loved ones serving in the military. “Really it’s our chance, in a very small way, to say thank you to the folks who serve our country and the family members of those who serve our country by serving them,” said Greg Bibb, the executive vice president of business operations for the Wizards. Before the airmen returned to duty, the Wizards signed autographs, took photos with airmen and left small souvenirs for them to remember the event. “It means a lot that they take the time out to recognize us,” said Staff Sgt. Chris Pearson, a dental assistant at the 79th Medical Wing, native Washingtonian and Wizards fan. Watch the Wizards off the court, serving the military in their own way in this NBA video.